Tbilisi Mayor Kakha Kaladze says that the visual aspect, as well as the architecture of pedestrian bridges in the capital Tbilisi, should change. Kaladze believes that the commercials which are placed on the bridges over the highways, “damage the look” of the city. “First of all I mean the people with certain disabilities, who cannot use the bridges at all,” Kaladze said. Kaladze tasked his deputies to adopt the conception for such bridges with experts. “When it comes to commercials and advertisements, I believe that business interests should not be damaged. 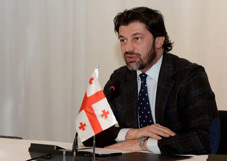 However, the business interests should not be met at the expense of Tbilisi look,” Kaladze stated. 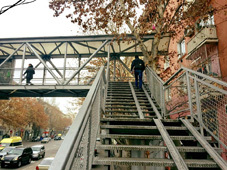 The civil sector has been long criticizing the Tbilisi government for the pedestrian bridges, which are useless for the people with disabilities. The bridges have ramps for the disabled. However, the people cannot use them as they are wrongly constructed. It is even impossible for a physically trained man in a wheelchair to use the ramp to roll up onto the passage.